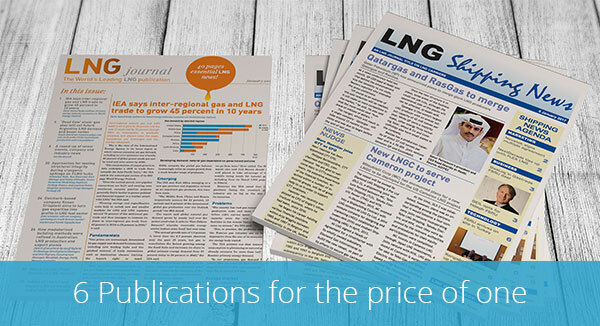 LNG Journal is the longest-standing magazine in the LNG industry, with over 700 leading companies subscribed to our services, the LNG journal is a must read source for analysis, news, prices and information in the liquefied natural gas industry. The journal's comprehensive coverage is dedicated to the entire LNG value chain; from technological innovation in the engineering sector to project financing to market trends to LNG shipping operations. Different multi-user options are available on request. GBP price UK only -- EUR price Europe only -- US$ price Rest of the World. Alternatively, download the subscription form and email to subs@lngjournal.com. * DEFINITION OF USERS: Access to the LNG journal and LNG Unlimited is supplied on a single user, single license basis. Each user license entitles one individual to use their personal login details for their personal use only. This user may not share their login details with other individuals. For print and online subscriptions each user receives an individual printed copy of the LNG journal in the post. User may print a copy of the PDF edition for personal use only ** The LNG journal magazine is published 10 times per year with occasional special editions. *** The LNG unlimited magazine is published weekly 32 times per year.